After a few busy and productive days in Sydney it was time to come home, my flight was at 4pm but I got to the airport about 2.15pm. I started off at the beach but decided to head to "Sheps Mound" for a while. All the photos were taken on my little pocket camera. I returned my hire car and after clearing security I went straight upstairs to the Qantas heritage Museum, although you are shooting through thick curved glass it still is the best place for a full runway view inside the terminal.. Just as I walked in a SQ A380 was rotating in the distance.. The flight itself was smooth and very comfortable but unfortunately that is were the comfort ended as I had a huge very intoxicated male in the middle seat who wanted more than his seat and arm rest. Not even 12 months in and Air China have decided to suspend flights out of Brisbane from September 2018 through to January 2019. This news has got the Queensland Government fuming and asking "WHY?" Air China says it is all due to a shortage of aircraft. 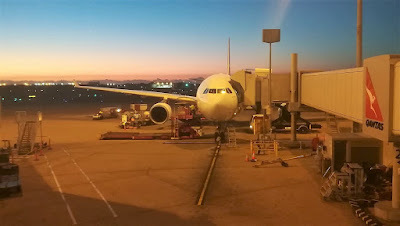 I cant believe how quickly these monthly trips come around, I was back at the airport this morning for my flight down to Sydney but this mornings flight had a little bit of excitement to it. I was coming down on their Airbus A330-202 which was a really nice change to the Boeing 737-838 we always get. We began taxing at 6.41 and taxied out for runway 19. Approaching the Alpha One holding point we continued out onto 19 for a rolling start getting airborne at 6.46am. We did the usual left and right banks and then set course for Sydney, climbing to our cruising flt level of 400 (40,000 feet). The flight down was very smooth and comfortable except for approach. We began our descent at 7.30am and landed on runway 34R bang on 8am. Flight number 25 for the year was done and dusted. 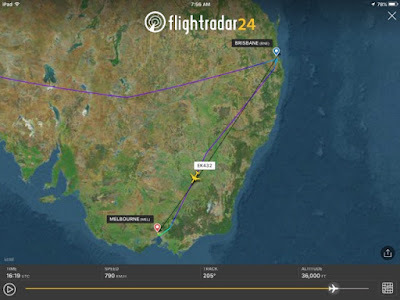 Last nights Malaysia Airlines Flight MH134 was forced to return to Brisbane airport an hour after being airborne due to a technical fault. The aircraft departed runway 01 at 11.31pm Brisbane time (9.31pm Malaysian time). About 40 minutes later, MH134 pilot Captain Charles Chelliah announced that the flight was required to return to Brisbane airport after the airspeed indicators failed during take-off. Airlines cover pitot tubes during turnaround at Brisbane Airport to prevent obstruction by mud wasps. According to passengers on the flight they experienced a rough landing and the aircraft suddenly came to a stop on the runway. In a post-landing announcement, Charles said the aircraft was unable to taxi on it own and was waiting to be towed to the terminal. He also explained that the plane cannot be towed because the landing gear door is open. According to a Malaysian passenger, passengers have remained calm and almost all of them were seen texting their family and friends about the incident. 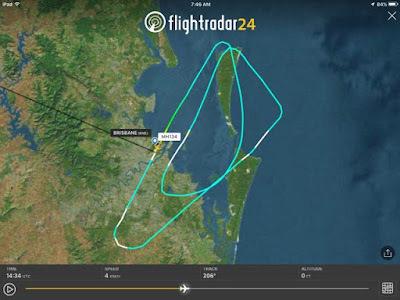 At 1.32 am Brisbane time (11.32pm Malaysian time), the in-flight entertainment was been stopped and the aircraft still remained on the runway. Due to Brisbane airport being closed to take-off and landings the arriving midnight Emirates flight (EK 432) diverted to Melbourne.